One of the best pieces in my wardrobe, one that really helps me drive my persona look home, is my black wool open hood. I have two hoods (the other is rust-red linen), but the wool hood is probably the single most worn item in my garb closet. I'm pretty sure that the hood has become a trademark of mine in my local region, and those people that may be looking for me are looking, in actuality, for that black hood. My black wool hood. Oh, and my handsome husband. Three years ago, when I first made the hood, there were really only two sources available online for the specific patterning of the open hood. One was Marie Chatel Cadieux's page on open hoods, where, in addition to tons of pictures, she shared a rough, not-to-scale drawing of what her hood looked like flat after cutting it out. She also gave us the length of the liripipe. That page, unfortunately is no longer online, but it was truly the biggest inspiration I had to make my own hood. Unable to really work out a pattern from Marie's information, I turned to Lia de Thorngegge's open hood. While she didn't have a pattern or measurements to work off of, she did provide a photo of the hood as it looked cut from the larger piece. My first open hood attempt in a single layer of blue wool. With a better idea of the basic shaping, I tried a hood out with some bright blue wool. It wasn't nearly perfect, but wearing it to 12th Night that year, I had a much better idea of what worked and what needed more attention. In particular, I needed to enlarge the brim and shape the collar better by adding gores. I also knew that weight made a difference, and that the stiffer the brim, the better the look. With those changes, I was able to find the correct shape for my black hood, and I've never looked back. There is still a lack of patterning help out here on the internet. While I've posted pictures of my hood numerous times here, I've never provided anything more. With Marie's page MIA, there are also fewer pages out there that really look deeply into the open hood style for those people looking for research. 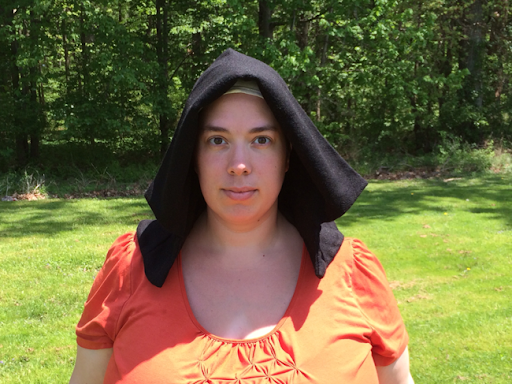 I've put together an article that discusses the evolution of open hoods through the 14th century into the 16th century, so if you're looking for the historical perspective, you can read that here. That's a permanent page on this blog, so you if you need to go looking for it later it won't be buried in the pit of my post archives. 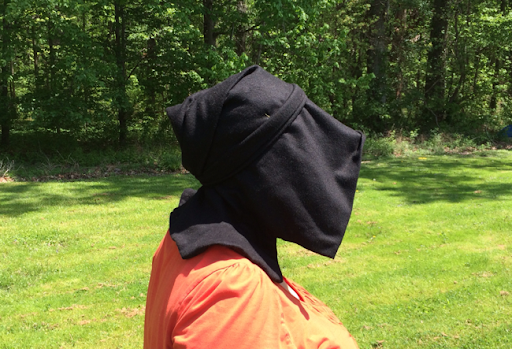 At the end of this post, you'll find a link to a PDF containing a pattern with measurements, along with images and notes about my two hoods and how I made them. 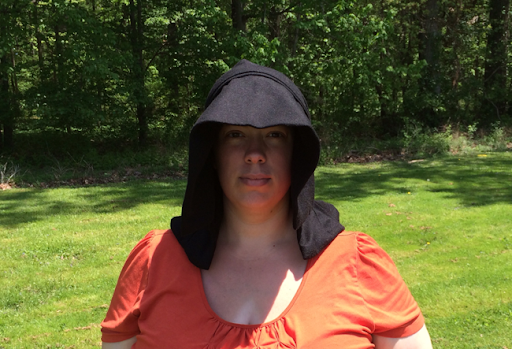 It is my hope that by having an actual pattern for an open hood available, we might begin to see more hoods around. It's a start at least. That comes with a caveat, however. 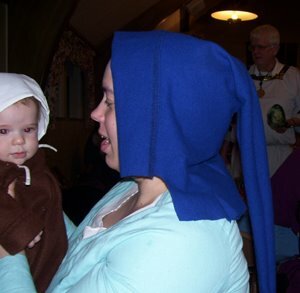 When I created my hood, I was at the stage in my costuming career where I heavily relied on seeing what others were doing to make my own items. It was easier then, given my limited sewing skills, to understand real-life items and copy the looks I liked. Being able to look at a period image and analyze it to determine how to recreate it was a long way off. Now, however, it's time to look back at my hoods. 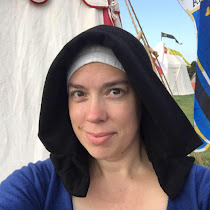 So in this post, I'll be focusing specifically on my retrospective research and thoughts regarding the shape and construction of 15th Century open hoods. In the end, you'll hopefully see, as I do, that while my hood is perfectly acceptable, there's still room for improvement and more accuracy. And as a warning, this post is pretty lengthy and covers a lot of ground. 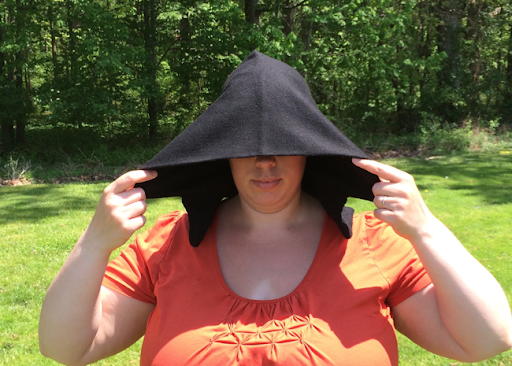 Open hoods are not easy to pattern. 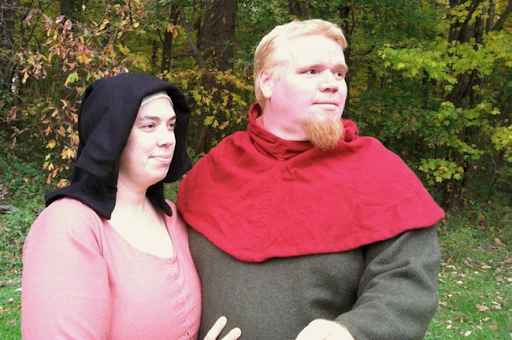 Like so much of the fashion in the 15th century, the open hood style was a fitted garment. If done carefully, at can certainly be an off-the-rack type of item, so their fitting isn't necessarily custom. The shape, and the way it's meant to sit on the head, though, can become quite specific. 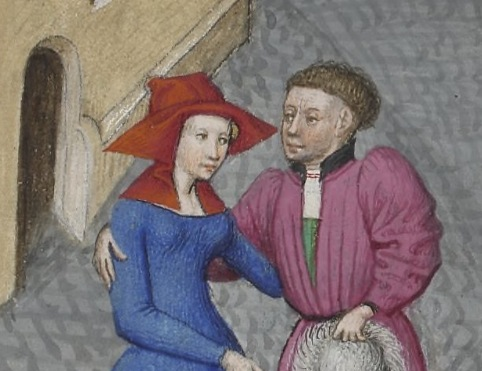 Detail, BnF MS Latin 7907 A, The Comedies of Terence, circa 1400-1407, fol. 42r. Aesthetically, I prefer the look of the slightly winged versions, like the example above from the Comedies of Terence. This is the style that my winged open hoods most closely match. I would venture to say that most recreation hoods you'll find out there are similar to this as well. It's a modern preference, I think. A narrower hood just looks more "regular" to us, and certainly more wearable. As I study more and more images from the first third of the 15th Century, however, it appears that this narrower look, though preferable to my modern eye, was not truly fashionable- at least not in the first half of the century. Detail, Arsenal MS 5070, reserve, The Decameron, 1432, fol. 188r. Sharper-looking wings that stuck out nearly horizontally from the face, like the example from The Decameron above, are quite normal. The collar still appears to be tight around the shoulders, though excess fabric at the neck in this particular example creates an extra fold at the front. Whether these fashionably outward wings are shaped with a wire, we're likely to never know for sure. I'd hate to accidentally walk into one of those corners if there's a wire doing the work, though. I'd like to suggest, as an alternative for experimentation, that the brims were possibly stiffened with heavier wool (like a Melton wool or sturdy felt) stuffed between the brim layers. There may have also been starch involved, since we know starch of some type was used on the goffered veils popular just prior to this at the turn of the century. The style of the open hood was by no means static. Since the early inception of the idea way back at the start of the 14th century, the open hood continually evolved and wound through class barriers over two centuries. The peasants loved it for its versitility, the lower middle class combined it with fashionable dress as a symbol of their class position, and the upper class embraced it as an alternative to the complex and cumbersome hats that dominated their affluent couture. Even just looking at the basic winged hood, differences in the styling from the beginning of the century to the end show that the look of the hood was constantly in flux. 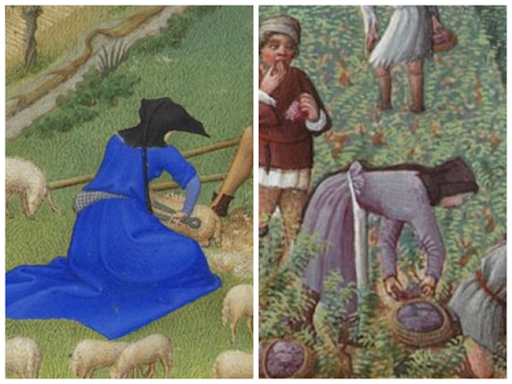 Details from July (left) and September (right) from Les Tres Riches Heures du Duc de Berry. Take the open hoods depicted in Les Tres Riches Heures du Duc de Berry. The calendar images in this iconic manuscript were completed by a handful of artists between 1411 and 1489. The July page, in which a shepherdess is seen shearing a sheep, was painted by Paul Limbourg sometime between 1411 and 1416. 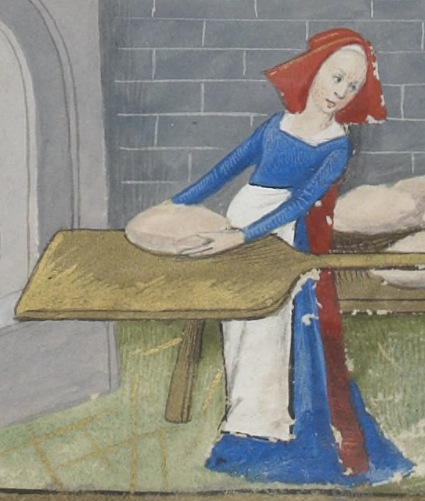 The female laborer in the field in the September page was painted more than 70 years later by Jean Colombe, circa 1489. They offer a wonderful comparison. We're looking here at two working women, each wearing rather typical outfits for their occupations, and each mostly turned away from the viewer. They both wear black winged open hoods, each with long liripipes. The two collars are very similar- covering most of the shoulders and back, but not longer than necessary to cover any exposed skin. The liripipes are both very long, extending past the waist. The later version does appear to have a better handle on the fold at the start of the liripipe, creating a more intentional corner, and there is a little bit of the sense that the later liripipe is possibly bulkier in general. It's the wings, however, that stand out from each other. 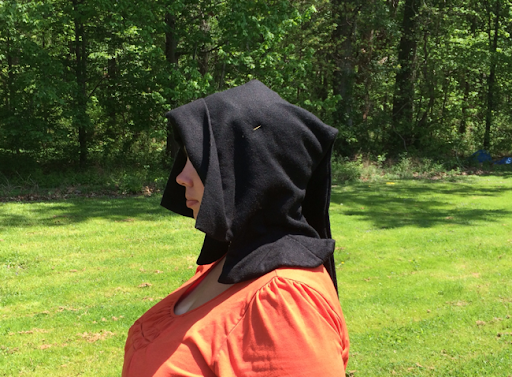 Where the earlier hood clearly favors the pointed, outward shape, and does not sit at all close to the head, the later hood's brim is folded neatly back, and is minuscule by comparison. Detail, BnF, MS Latin 1173, Heures de Charles d'Angoulême, fol. 20v. But we can't draw the pattern of change too definitively here. Around the same time Colombe was painting hooded peasant women in Les Tres Riches Heures, Robinet Testard and his team of artists were completing their work on Le Heures de Charles d'Angoulême. 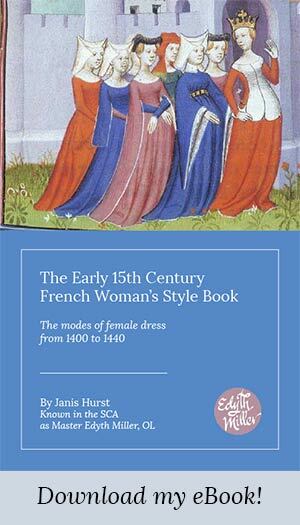 This manuscript contains some of the best and clearest examples of lower class French fashion at the end of the 15th Century. 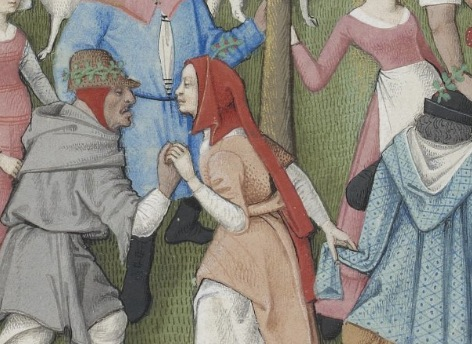 A great and iconic image of a peasant wearing an open hood can be seen in the Dancing Peasants panel above. The wide liripipe here is very clear, helping to make sense of why Colombe's liripipe version looks like it should be interpreted as wide. The collar is small, even more so than either of the Tres Riches versions, but as with the others, her exposed skin is covered by the hood, offering the same kind of practical protection. This collar is very close to the collar on my hoods- trim and minimal. What makes this a notable look, however, is the zig-zag fold to the brim. In the perspective given us, we are looking at the hood directly from the side. The fact that the wing is forced back to the front indicates that it may not simply jut out from the head a little stiffly, as it does in the Comedies of Terence example, but is rather forced forward to perhaps increase the outward appearance. Detail, BnF, MS Latin 1173, Heures de Charles d'Angoulême, fol. 6v. Earlier in the manuscript, the pages are decorated with short panels along the bottom depicting various scenes of everyday life. Among them are a few women wearing open hoods, such as the baker's wife above. 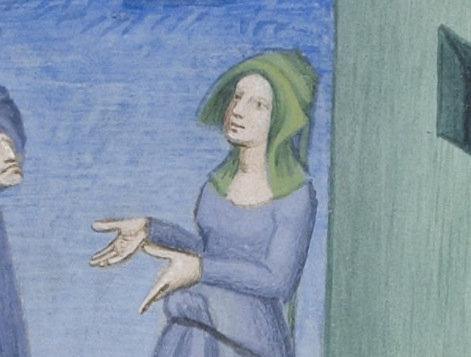 All the hoods in this section of the manuscript are missing a collar, but seem to have compensated for that lack by being generally larger in overall shape. The wings are quite large as a result, and though they do extend out pretty far, proportionately they don't have the same horizontal jutting quality as the hoods of the first half of the century. Here also, there is no indication that the brim is folded more than once. So what does all this mean? Well, for starters, it means that there really is no single open hood style that can be labeled as the de facto style of the 15th Century. Even still, there are some very specific things that we can look at to better understand the possibilities of the style, and to more accurately pinpoint specific looks. 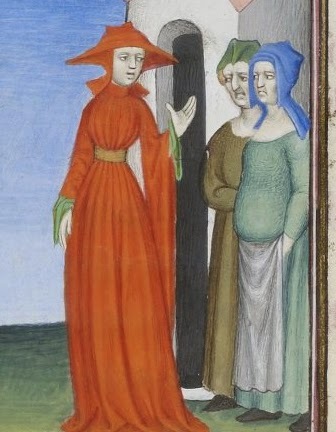 Quite plainly, not all hoods in the 15th century were the same. Details from fol. 143v of De claris mulieribus (left) and fol. 66v of the Roman de la Rose (right). One element of the hood that really shows a consistent evolution throughout the century is the shape of the liripipe. Earlier years, coming out of the narrowness preferred at the end of the 14th century, liripipes are rather thin and rope like, such as those seen in the 1403 copy of De claris mulieribus (BnF MS French 598), including Proba's above. Later in the century, liripipes are wide and flat down their entire length, and create a neat corner fold at the top of the head, like those seen in the late 15th Century Roman de la Rose (OXF, Bodlien MS Douce 195), also above for comparison. These two images additionally offer great counterpoints to each other, and though they can both be called "open hoods" they are clearly not the same. I won't belabor the comparison, as you can see their differences for yourself, but just to make a statement about the changes, later or early, comes down quite plainly to the question of scale. It's important that I reiterate, however, that just because one style of hood was "more fashionable" than any others doesn't mean that those others disappeared. In my research for this post, I came across countless examples of hoods of all types throughout the century. The Courtesan Bacchis and her nurses, Comedies of Terence, fol. 115. Most often (though not exclusively) hood style and class have a direct correlation, and is the best way to determine which particular styling was considered the most fashionable at any given time. Important to this point is the understanding that until the end of the century, the hood was not generally preferred among the higher classes. When the upper echelons finally decided to use the hood, it was not the same type of hood we've been looking at. For one, it lacked a liripipe. That means that when we're looking at winged, liripiped open hoods, we're looking primarily at the range of women between laboring peasant and bourgeois housewife. Taking a look at their gown along with their situational context will provide a better idea of the woman's position in that range. 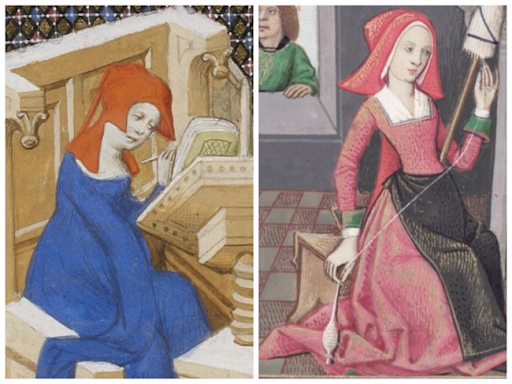 For instance, in the grouping above, the lady in the red houppelande holds the higher class. She is a courtesan accompanied by her nurses. Her hood, therefore, can reasonably be assumed to be the more fashionable version of the three here. Before I conclude, there's one last thing I'd like to discuss. I've stated in the past, here and in my classes, that the hood was a stalwart element of lower class clothing, because it makes practical sense. While I knew this had to be true, it had admittedly been difficult for me to truly come up with the reasons why. Certainly, simply covering the head is a practical application on its own, but there is more to it than that. 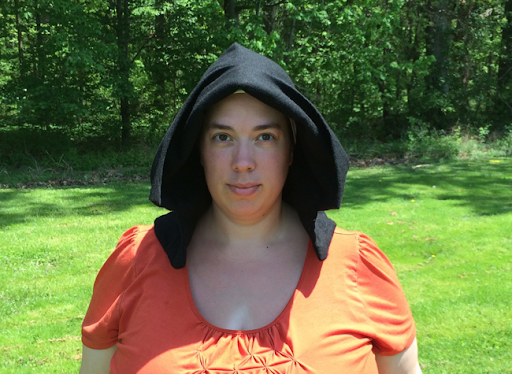 Last weekend, I spent the day in garb in the sun. It resulted in a terrible sunburn on my chest, face, back, and the visible portions of my bust. 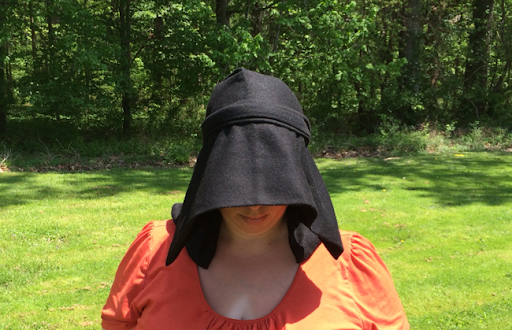 Just like my medieval forebears, I had no sunscreen, and I paid the price for the lack of protection. Getting a sunburn isn't something only modern day humans have a problem with. 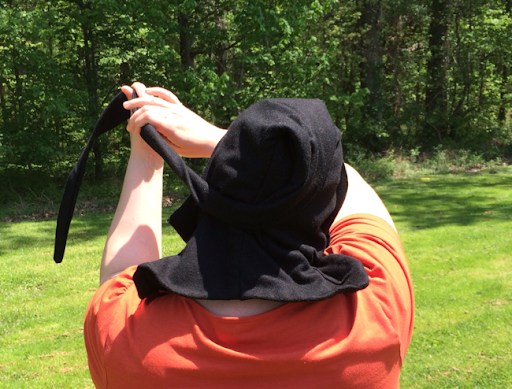 Today is quite sunny, so to put the practical application of a hood to the test, I put it on, and went outside. Here are the ways my hood worked for me..
Alright. Time to wrap this up. I go forward from here with more specific ideas about what my next hood should look like. As a middle class townswoman, who endeavors to be as fashionable as her means allow, I should prefer the outward, pointed wings on my hood. This will come with some experimentation and certainly take some getting used to in terms of wearing. I'd never forgive myself if my hood poked somebody's eye out. Lastly, as promised, you can download from here the pattern and construction information on my black open hood as well as my red version. I hope that it helps you skip a bit of the frustration of patterning one of these things from scratch. I also hope that my digging deeper into this style encourages you to begin looking closer at the things we're recreating.